Looking for winning game tables? Choose one of the custom-made, solid hardwood units below from Brandenberry Amish Furniture. Amish artisans hand-build them all. So they’re stronger, more durable and longer lasting than tables you’ll find in most big box and chain furniture stores. 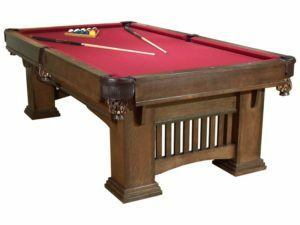 Rack ’em up and get ready play pool on this Classic Mission style hardwood game table. A truly versatile game, the Hickory Country Delight Game Table can self-store and be used for a variety of fun games. 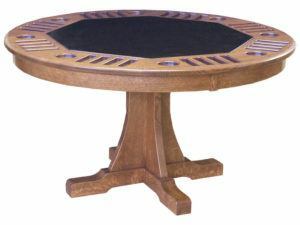 A sturdy Oak pedestal and leather top accent the finely-crafted Signature Mission Poker Table. 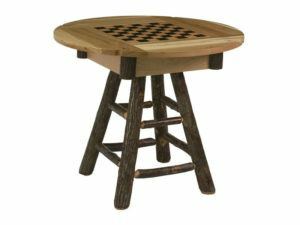 Brandenberry Amish Furniture lets you do more than show your best hand at the game table. Because you can also display your fine tastes in furniture by selecting one of our game tables. You can order a poker table, 8 foot pool table, round poker table or other product/s as shown or unfinished. Or, you can let us customize it for you. So the furniture will fit right into your home. But our game tables are way beyond ordinary. This is because Amish cabinetmakers painstakingly handcraft each unit. And they use solid hardwoods. Like maple, oak, cherry and hickory. So, with proper care, the table you choose can help make your game room a welcome spot for decades to come.